It was a shame I couldn't make it to the main event for a couple of years now. This school holiday, we were on a family trip to Gold Coast during the final days of the state wide Harvest Festival celebration. 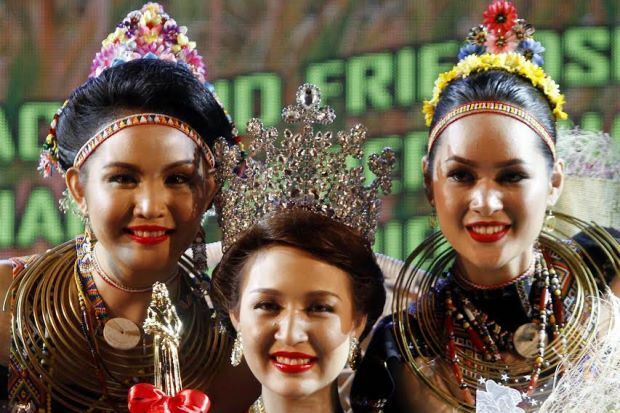 KOTA KINABALU: Student Sherry Anne Laujang of Penampang was crowned this year's Unduk Ngadau or Harvest Queen in the penultimate event of state-level Kaamatan festivities. The 21-year-old Kampung Ramayah resident outshone 43 other contestants from around Sabah as well as the Klang Valley, Johor and Labuan to take the title. In second place was 23-year-old Claryssa Henry of Kudat while the third spot went to Fenny Ester Joslin, 21, of Sabah's northernmost island of Banggi. They received their prizes from the wife of Sabah Yang di-Pertua Negri Toh Puan Norlidah RM Jasni. Earlier in the day, the ritual chanting of Kadazandusun priestesses in the age-old magavau or thanksgiving ceremony was among the events to kick off the harvest festival celebrations. The festivities at the Hongkod Koisaan in Penampang here started with the cutting of seven padi stalks. Yang di-Pertua Negri Tun Juhar Mahiruddin performed the symbolic harvesting and later beat a gong seven times. Also present was Deputy Chief Minister Tan Sri Joseph Pairin Kitingan, who is also the Huguan Siou or Kadazandusun paramount leader. Pairin later read out the speech of Chief Minister Datuk Seri Musa Aman, who said Sabah gives priority to cultural festivals like Kaamatan because they help foster unity and understanding among the state's diverse communities. The celebrations included cultural performances, including the sumazau dance of the Kadazan of Penampang, the pokodinding of the Dusun Tindal and the sayau of the Dusun Liwan.